We’d love your help. Let us know what’s wrong with this preview of A Simple Winter by Rosalind Lauer. Suddenly patriarch of his large family, Adam struggles to do the right thing for his siblings, his community, and his God. He neither wants nor needs the complications that spirited Remy brings. But as much as he tries to push her away, even as he counts all the ways this lovely outsider cannot possibly remain in his world—or in his heart—the wondrous light she shines upon his troubled soul cannot be denied. Adam can only pray for the strength and the faith to get this Englisher girl out of their lives for good. To ask other readers questions about A Simple Winter, please sign up. This is the kind of book you just want to curl up with and read straight through from beginning to end. Unfortunately life got in the way and I had to do essential things like work and sleep, but the story so ensnared me that even when I wasn't reading, I found myself anticipating the next time I would be able to. Remy captivated me right from the start, so clearly at a crossroads in her life -- questioning past hurts but not learning from them as she struggles to find her place in the world. Sh This is the kind of book you just want to curl up with and read straight through from beginning to end. Unfortunately life got in the way and I had to do essential things like work and sleep, but the story so ensnared me that even when I wasn't reading, I found myself anticipating the next time I would be able to. Remy captivated me right from the start, so clearly at a crossroads in her life -- questioning past hurts but not learning from them as she struggles to find her place in the world. She's looking for meaning and security and love -- a special place to belong. Adam, on the other hand, has that belonging place and the love of a large family. He is secure in his community but conflicted in his heart. A chance meeting between the two at a crucial point in both their lives is the impetus that hurdles them both into a complicated dance of conflicting emotions. Such a tangled tale! So many twists and turns punctuated by blissful interludes that stole my breath away. Lauer has spun a captivating tale and I look forward to reading more from her. This is my second novel by this author, which is really saying something because I was a little harsh with my first review. But alas, here I am again reading one of her books. I liked this one more than the first one. The two MC's were likable. I also liked that this wasn't about just one story line. The fluffy romance was front and center, but the murder mystery was a nice balance. This was probably 2.5 stars, but I struggled with some of the repetitive writing so 2 stars. This book was one of the best Amish stories I have read to date! It had everything, romance, mystery, but best of all a happy ending! Oh my word. Can I possibly explain just how fantastic this book is without giving too much away about how everything turns out. A tough job but someone has to do it. First of all, No slow start for this book. The intrigue starts in the first paragraph of the first chapter on the first page. We are immediately drawn into this story of heartbreak, loss and of feeling lost. The characters grab our attention and do not let go. Rosalind Lauer is an excellent storyteller. She spins a story of mystery an Oh my word. Can I possibly explain just how fantastic this book is without giving too much away about how everything turns out. A tough job but someone has to do it. Rosalind Lauer is an excellent storyteller. She spins a story of mystery and intrigue that draws us in and makes us feel a part of the whole thing. We are part of the King family. We are part of Remy’s world-wind life. I'm rather surprised at myself for giving a full 5 stars to an Amish romance book, but after much though I can't find a reason not to. I became interested in reading this after I read the sequel "A Simple Spring" some months ago and thought it kind of cute. However, "A Simple Spring" pales in comparison to this, which is just flat-out a great novel: stellar writing, interesting characters, a great plot, and just an enjoyable read. Remy McCallister first meets Amish Adam King on a train. A year la I'm rather surprised at myself for giving a full 5 stars to an Amish romance book, but after much though I can't find a reason not to. I became interested in reading this after I read the sequel "A Simple Spring" some months ago and thought it kind of cute. However, "A Simple Spring" pales in comparison to this, which is just flat-out a great novel: stellar writing, interesting characters, a great plot, and just an enjoyable read. Remy McCallister first meets Amish Adam King on a train. A year later, frustrated with how her life is going, she meets him again in order to write an article on the Amish community and the murder of the King family's parents. Remy becomes sucked into the Amish community and the King family even as she finds herself falling for Adam. To balance the romance is the enduring mystery of just who the murderer is. I loved this book. I've wondered for quite a while what the attraction was to these Amish books. While at a recent romance writers conference, this book was given away in our goodie bags. Now I understand why Amish books are so popular. I'm buying the next one as soon as my new Kindle arrives in the mail. I rarely give a book 5 stars but i really enjoyed this book. Every character was so alive and the story line was great. I am so glad I found this book and there is no doubt that I will read books from this author again. Thank for a great clean mystery romance! Such a lovely escape from life in these turbulent times . A reminder that life could be simple, peaceful, filled with love. A mystery solved, a love story. I would recommend this book as an escape, a light jaunt thru a different culture. I couldn't put this book down. It was sweet, simple ,spiritual and just thee right amount of mystery. I love happy endings and this book fulfilled all my needs. 3.5 Stars, and probably one of the best of the Amish books that I've read this year, (I know, I know, I swore I was done after the debacle of the last one, but I saw this at the e-library and couldn't resist), but still a bit unrealistic (though, let's face it, we don't read any kind of Romance story for its realism . The unrealistic portion for me was probably (view spoiler)[ how after less than a week of staying with 1 Amish family Remy was completely willing to change her entire way of life. 3.5 Stars, and probably one of the best of the Amish books that I've read this year, (I know, I know, I swore I was done after the debacle of the last one, but I saw this at the e-library and couldn't resist), but still a bit unrealistic (though, let's face it, we don't read any kind of Romance story for its realism . From the publisher: As a budding journalist with a major newspaper, Remy McCallister is eager to prove herself. While investigating an unsolved crime, Remy winds up in the tightly woven Amish community of Lancaster County, the last place she would ever expect to find herself. The story leads her to Adam King and his ten younger siblings, who are trying to sustain their warm, loving home in the wake of the murder of their parents. Although Remy tries to remain professional, she is captivated by t From the publisher: As a budding journalist with a major newspaper, Remy McCallister is eager to prove herself. While investigating an unsolved crime, Remy winds up in the tightly woven Amish community of Lancaster County, the last place she would ever expect to find herself. The story leads her to Adam King and his ten younger siblings, who are trying to sustain their warm, loving home in the wake of the murder of their parents. Although Remy tries to remain professional, she is captivated by the Kings. With her own mother gone and her father disengaged from their relationship, Remy longs for a home and a family just like that of these good, simple people. 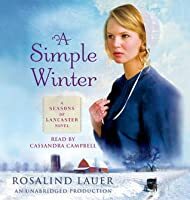 'A Simple Winter' by Rosalind Lauer is a sweet tale of a young woman who gets involved with an Amish community that is turned upside down when a mother and father of eleven children are murdered. Remy suffers from seizures and as a result is forced to drop out of college and move back home. On the way, she meets a young Amish man on the train and from there, their lives would never be the same. After joining her father's newspaper, Remy decides to write a story on the death of Adam's parents. 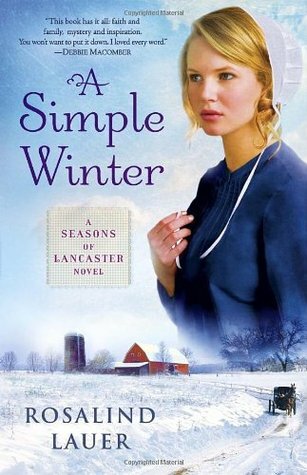 Wh 'A Simple Winter' by Rosalind Lauer is a sweet tale of a young woman who gets involved with an Amish community that is turned upside down when a mother and father of eleven children are murdered. Remy suffers from seizures and as a result is forced to drop out of college and move back home. On the way, she meets a young Amish man on the train and from there, their lives would never be the same. After joining her father's newspaper, Remy decides to write a story on the death of Adam's parents. What she doesn't know is just how hard this task would be. This is a book that is kindhearted and makes you smile, even through the difficult moments in the story. The Amish community is something that very few people get to experience and this story brings you right into it. And like the community itself, the plot is steady and hardworking without a need for fast action or unforeseen surprises. It is a great read fora quiet evening at home. Rosalind Lauer did a wonderful job bringing her characters to life. I felt the hurt, the love, the warmth of the King home.......so inviting. Adam and Remy's story is one that will stay with you for a long time; the whole King family will stir up emotions inside you. I encourage you to read this book if you are struggling with hurt and forgiveness. Or if you simply want to steal away to a simpler way of life and enjoy watching the King story unfold. Guaranteed to please, no matter the reason for reading it. I have always enjoyed reading about the simplicity of The Amish way of life. things in life are really the best things. Remy, who works for her father at the Post, meets an Amish man, Adam on the train. He is returning to Lancaster County after the death of his parents, to take over raising his 10 siblings. They strike up a conversation and once they go their seperate ways - Remy pitches his story to the paper. The paper send her to Lancaster Country for a follow up to the murder of Adam's parents. Afraid of how Adam will react to her being a reporter she friends the family and ends up s I really enjoyed this book. Afraid of how Adam will react to her being a reporter she friends the family and ends up stranded with them for a few days due to a horrible storm. This was the first time for me to read a book written by Rosalind Lauer and her Amish series will be a repeat for me in the future. I loved this book because Rosalind Lauer had a way with using the right words to draw her readers into the book, to make you feel like you were right there living the scene with the characters too. I tell ya' I didn't see the "who?" for the murderer coming as I was reading. As a former resident of Lancaster county (and I am moving back), it is always great to read stories about the people there. We were there this Sunday and passed many buggies on the roads. What a wonderful story!! I loved this book; could not put it down. I am looking forward to reading the next book, A Simple Spring. Update 09/29/14: Somehow, I never got around to reading the second and third books in this series, so I decided to re-read the first book before going on to the next two. This book is even better the second time around. I loved it!! I highly recommend it! I won this from Goodreads, and was hoping this was not another cookie-cutter Amish book. That being said, I can honestly say this is the best Amish book I have read to date. It is part romance, part mystery, which adds more excitement and depth to the characters and plot. I liked the realistic interaction between the characters, making them seem like real people, not the "perfect" personalities sometimes typical in Christain fiction. Although fairly predictable, there were surprises, too. This i I won this from Goodreads, and was hoping this was not another cookie-cutter Amish book. That being said, I can honestly say this is the best Amish book I have read to date. It is part romance, part mystery, which adds more excitement and depth to the characters and plot. I liked the realistic interaction between the characters, making them seem like real people, not the "perfect" personalities sometimes typical in Christain fiction. Although fairly predictable, there were surprises, too. This is a sweet, enjoyable read that leaves you with good feeling. Remy McCallister and Adam King meet on a train when headed home to Pennsylvania. Adam, an Amish man, is heading home to take care of 10 siblings after the death of both parents. Remy, who has also lost her mother, is headed home to work as a journalist at her father's newspaper due to some health issues. A great all around Amish fiction book about love, trust and forgiveness. The plain life is depicted to be a quiet life filled with love and hardships along the way. If you love Amish fiction you'l Remy McCallister and Adam King meet on a train when headed home to Pennsylvania. Adam, an Amish man, is heading home to take care of 10 siblings after the death of both parents. Remy, who has also lost her mother, is headed home to work as a journalist at her father's newspaper due to some health issues.